Did Mohamad Hasan receive cross-ethnic support to secure his Rantau win? Datuk Seri Mohamad Hasan retained his position as Rantau MP when he emerged victorious at the Rantau by-election last Saturday. Hasan had the majority over other candidates with a total of 10,397 votes. Hasan’s main rival Dr S Streram from PH only garnered 5,887 votes, while independent candidates R. Malarvizhi and Mohd Nor Yassin polled 83 and 79 votes respectively, meaning the duo would lose their deposits for failing to obtain one-eighth of the total accumulated votes. The outcome of the by-election fuelled various reactions from the public. These include alleged fights between members, and unauthorized people stopping police vehicles to inspect for phantom ballot papers. 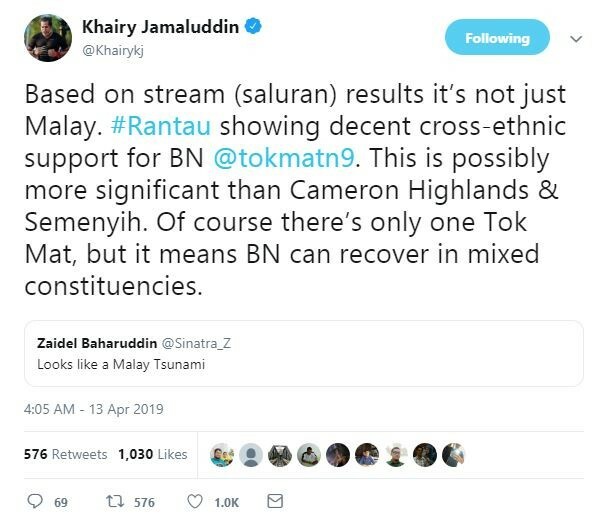 UMNO member Khairy Jamaluddin gave a culturally unbiased opinion on Hasan’s win. He claimed Hassan won with a decent cross-ethnic support. As of today, it is still uncertain on how true his statement is. 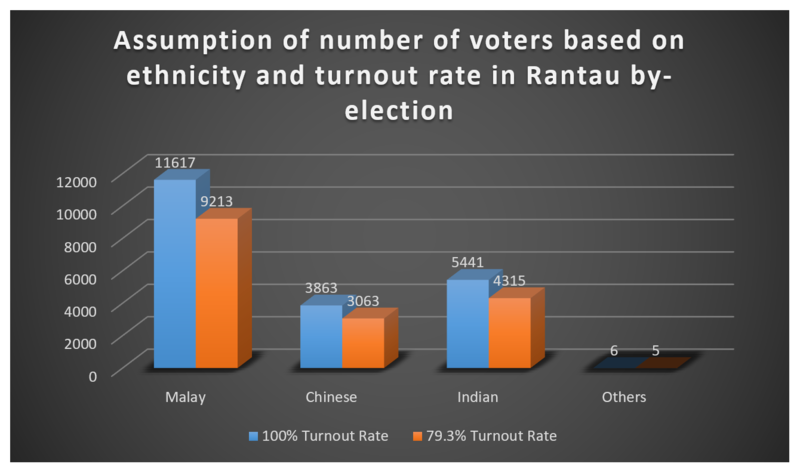 The Election Commission (EC) announced that 79.3% of Rantau registered voters turned up for the by-election. According on the data, 79.3% voter turnout rate with valid ballots equals to 16,446 voters, excluding 146 rejected ballots. Hence, after assuming the turnout rate of all ethnicity is the same as reported, the data would show as below. The election result indicates that the UMNO acting president received 10,397 votes. 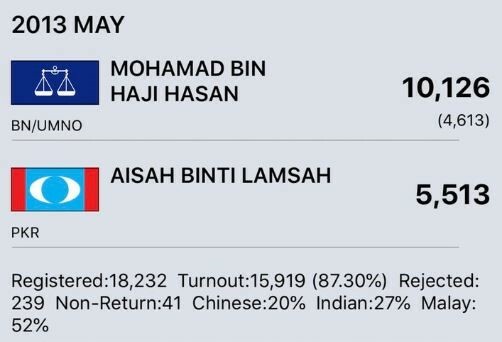 Based on the reports and the chart tabulated, if Hasan hypothetically gained all the 9,213 Malay votes, he still need to gather votes from the other ethnicities. 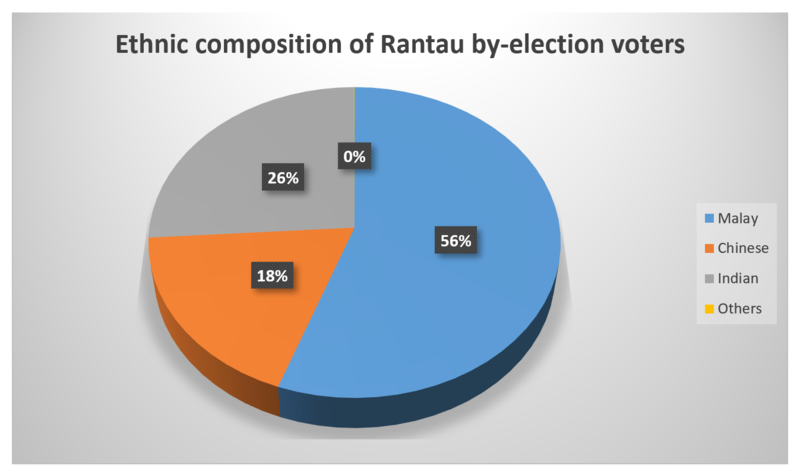 In comparison, GE-13 in Rantau showed that it had 87.3% turnout rate, with Hasan yet again taking the win with almost the same amount of votes as the recent by-election. Perhaps the drop in turnout rate signified political fatigue from people who were unbothered by the by-election. Despite that, the results are just a vague reflection of the ethnic split during the by-election, because it is impossible to rule out every possible outlier, such as extreme low turnout rate of a specific ethnicity, and invalid ballots etc. In conclusion, Khairy’s take on the by-election may be significant and should not be ruled out.